Our mission at Team Survivor Northwest is to provide a broad range of fitness and health education programs to enable women cancer survivors, in any stage of treatment or recovery and at any fitness level, to take an active role in their ongoing physical and emotional healing. Our guiding principles include empathy, teaching, cultivating, encouraging and nurturing. We serve all women, without regard to race, age, color, sexual orientation, gender identity, national origin, physical or mental disability, or religion, with any type of cancer diagnosis, at any fitness and skill level. All our instructors are experienced trainers with understanding of cancer specific needs. Program delivery is mindful of the physical and emotional sensitivities surrounding cancer. Our programs are free of charge to TSNW Members. Programs are offered in various locations within the Puget Sound Region. We continually share with our community, through a variety of methods, important and emerging information related to cancer survivorship. In 1995, a group of women cancer survivors in Seattle decided to train for a triathlon. They asked Dr. Julie Gralow, a local oncologist, to serve as their team physician. During the training process, Dr. Gralow was both inspired by the tenacity and strength of these women and amazed at the physical and psychological benefits that the women gained through training. Dr. Gralow continued to meet women cancer survivors looking for fun, interesting ways to improve their overall fitness. 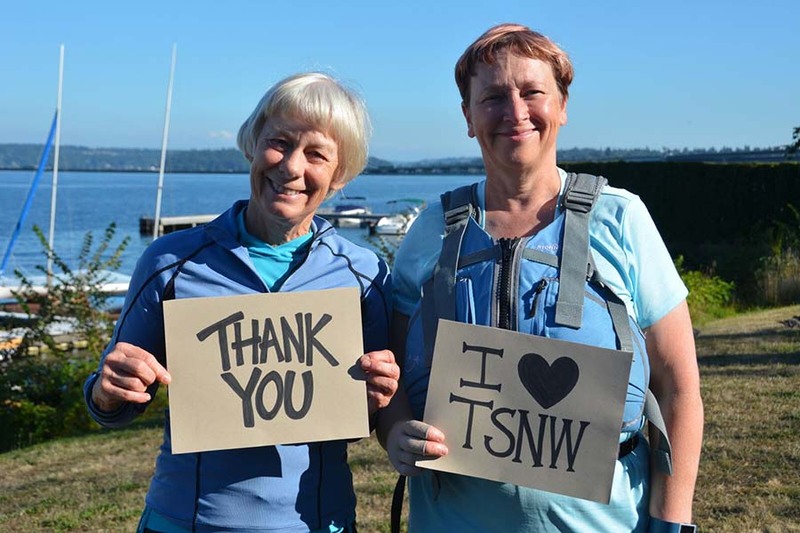 To teach women cancer survivors how to use exercise for physical and emotional recovery, she partnered with Lisa Talbott, a fitness and therapeutic exercise specialist, to found Team Survivor Northwest (TSNW). Today, TSNW offers year-round fitness opportunities for all women cancer survivors. WHY FOCUS ONLY ON WOMEN? Recovering from cancer is a fragile time in a person’s life. Chemo, radiation and other cancer treatments wreak havoc on the body resulting in altered physical appearance as well as decreased stamina and strength. Combined, these often leave survivors feeling vulnerable. We’ve found that women are much more inclined to show up and participate in fitness programs with other women who have been through similar body changes and experiences. This decision was not designed to be exclusive, but to ensure that women cancer survivors feel welcomed and safe during this fragile time in their life. Thousands of women cancer survivors have participated in TSNW’s free fitness and health education programs. Team Survivor Northwest programs are open to all women with a past or present diagnosis of cancer. Members range in age from twenty to eighty. Participants are as varied as the activities they enjoy, but they are all bound by the common desire to take an active role in their physical and emotional well-being.